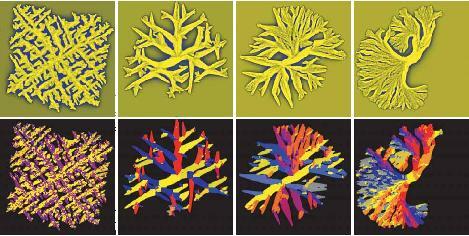 We discuss the formation of polycrystalline microstructures within the framework of phase field theory. First, the model is tested for crystal nucleation in a hard sphere system. It is shown that, when evaluating the model parameters from molecular dynamics simulations, the phase field theory predicts the nucleation barrier for hard spheres accurately. The formation of spherulites is described by an extension of the model that incorporates branching with a definite orientational mismatch. This effect is induced by a metastable minimum in the orientational free energy. Spherulites are an extreme example of polycrystalline growth, a phenomenon that results from the quenching of orientational defects (grain boundaries) into the solid as the ratio of the rotational to the translational diffusion coefficient is reduced, as is found at high undercoolings. It is demonstrated that a broad variety of spherulitic patterns can be recovered by changing only a few model parameters.